The collaborative musical vehicle of local composer, producer, and songwriter Jeremy Larson, Violents found magic in his teamup with former PHOX vocalist Monica Martin, for the project’s first full-length, Awake and Pretty Much Sober, which arrived earlier this year. Critically beloved, the LP has earned Violence + Monica Martin plenty of buzz, along with appearances for NPR, Paste, and more, and prompted Larson and Martin to bring their teamup to life, a rarity for Violents, which has largely been a studio project to date, with a performance tonight, Oct. 12 at The High Watt, featuring full live accompaniment and an opening set from MYZICA. If you’re a fan of Larson’s or Martin’s and haven’t yet discovered Violents, we implore you to give the album a spin, and if you’re new to both artists, then doubly so, because it is, without a doubt, one of the best albums of the year. You’re not likely to have many chances to see these songs brought to life like like they will be tonight, so grab tickets now and thank us later. Read on for more about why you don’t want to miss it! On its own, Violents is the singular musical force of classically trained pianist Jeremy Larson, a Nashville transplant and longtime fixture in the underground music scene, who’s produced, composed, and written for a variety of beloved artists. His latest vehicle, Violents was envisioned as a way to work with different vocalists on each release, collective style, and, since 2014, Larson has released collaborative EPs with the likes of Stacy King (Eisley, Sucre), Olga Yagolnikov (Kye Kye), and singer-songwriter Annie Williams, for which he’s served as the primary writer, composer, producer, and lyricist. 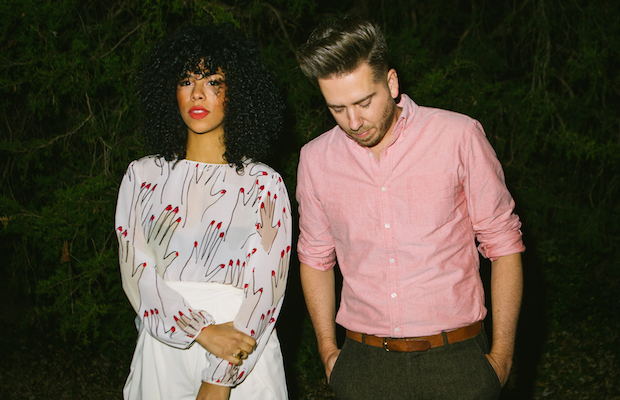 When working with Monica Martin, best known for formerly fronting Wisconsin folk pop outfit PHOX, Violents discovered an especially fruitful pairing, which blossomed into the project’s first full-length, Awake and Pretty Much Sober, released earlier this year. Juxtaposing the two talented artists’ diverse and different backgrounds, the LP combines lush, orchestral flourish with synthy, electronic, and beat driven tones, culminating in a dreamy, poppy, soulful masterpiece and definitely one of the year’s best under the radar releases. While previous Violents works have seemingly functioned as more of one-off in-studio effort, Violents + Monica Martin has transitioned into a full-on live force, if only for now, bringing to life their breathtaking LP in concert with full live accompaniment. Violents + Monica Martin are not a band so much as a magical collaborative effort, so catch these incredible artists together now before them move on to other projects. The brainchild of producer Micah Tawlks and singer Isaaca Byrd, indie pop duo MYZICA commanded our attention with hypnotic debut single “Ready Or Not” in 2014, before crafting their wonderfully synth-heavy, ’80s-inspired, eponymous debut EP the following year. With standout singles like “Wait Just a Minute” and “We Started a Fire,” MYZICA managed to garner national press and win over the blogosphere, helping reinforce the strength and allure of Nashville’s diverse, fast-growing pop scene, all before the release of their incredible debut LP, Love & Desire, which arrived last fall. MYZICA feel like not only one of the most exciting bands to emerge from Nashville in recent memory, but one of the most exciting pop groups period, destined to resonate with a wider audience thanks to their unparalleled pop hooks and wistful nostalgic appeal. If their unabashedly retro, wonderfully alluring debut is any indication, we have no doubt that this group are on a path to widespread fame, following in the footsteps of nostalgic, poppy, breakout stars like CHVRCHES and Carly Rae Jepsen; catch ’em now in small rooms while you still can! Violents + Monica Martin and MYZICA will perform tonight, Oct. 12 at The High Watt. The show is 18+, begins at 8 p.m. (doors at 7 p.m.), and tickets are available for $15.